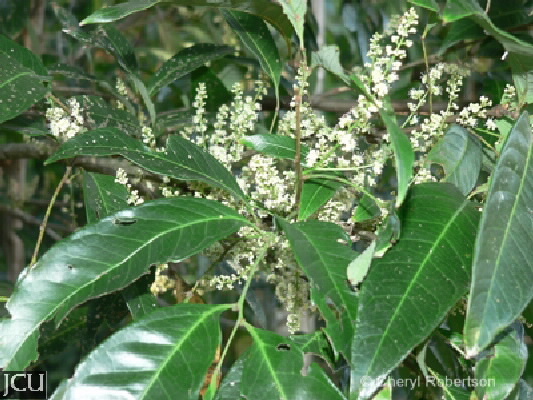 A local native tree growing along the margins of Half Moon Creek, leaves with 2-3 (4) pairs of lanceolate leaflets, paler on the lower surface, each leaflet somewhat asymmetrical at the base, terminal leaflet reduced to a very small spine. Flowers in a raceme; petals 5, white, stamens 8 disc green. Fruit a 3-lobed depressed capsule to 12 mm high. A yellow-to orange aril encloses the seed.